The latest issue of the Klaus Institute Newsletter – which I am still receiving for free, thanks – discusses many important topics. There's a speech by Czech ex-president Klaus about the EU's blunders; Strejček's discussion in what sense Trump is our role model (this article is also related to Dublin IV we will discuss below); Martin Slaný's brutal debunking of the "gender pay gap due to discrimination" myth (he shows tons of statistics proving that the gap is nearly zero whenever we compare commensurable employees etc. ); Klaus' eulogy for Rajko Doleček, a famous Czech-Yugoslav TV proponent of a healthy diet. But the most important specific topic is a set of answers by politicians and pundits to the question "How should we react to the proposed Dublin IV regulation". Now, to review the previous hyperlink, the Dublin Convention defines some shared policies of EU member states with respect to asylum seekers. 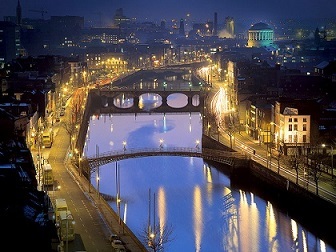 Dublin I,II,III were adopted in 1997, 2003, and 2013, respectively. One may disagree with the very idea of an EU coordination. Nevertheless, assuming that we take the EU for granted and try to use it in some sensible way, the Dublin Convention has always made sense. At least since late 2015, a new pernicious update was being prepared. The European Commission has discussed it as "its project" since May 2016. Fortunately, the proposal hasn't gotten too far yet. But the previous sentence may become obsolete abruptly. It's referred to as the Dublin IV Regulation and things would change completely. The central unelected EU authorities would have the full power over the allocation of the migrants to member states – including numbers and precise choices who goes where. A country could refuse an assigned migrant by paying €250,000 to a country that takes him or her instead. It's a lot of money but if we were forced to pay in some way, most Czechs would prefer to pay this amount, according to most polls. On top of that, there are some incredibly hostile details in the proposal. For example, the proposal says that the four countries with the lowest number of such migrants would be preferred as the destinations, especially in the case of problematic or dangerous asylum seekers. An equivalent formulation is explicitly written there. Now, it's amazing. You should also ask why the sentence chose the number four. It's not the most natural integer, is it? Well, we know what are the four countries now: they exactly coincide with the Visegrád Group (Poland, Hungary, Czechia, Slovakia). It's pretty amazing – the writers of Dublin IV have written their text to selectively target our alliance within the EU as if we were an enemy. Do you see how creepy it is? I think the text isn't too far from a declaration of war. In the newsletter, Mr Jan Keller, an anti-migration social democratic MEP and a sociologist, explains these basic data and insists that the Czech political elite has to refuse it and maximally search for allies to kill this dangerous proposal. Mr Ivo Strejček, a former right-wing MEP and a top official in the Klaus institute, outlines 7 points of a plan what to do. We need to discuss it, look for allies, coordinate things with President Zeman (who has said on TV that he would "veto" Dublin IV but I am not sure whether he will have this much power). Strejček questions whether most Czech politicians see the urgency of this threat. Mr Jiří Maštálka, a communist MEP says that it's incredible that this proposal isn't being intensely publicly discussed in Czechia. Yes, it's amazing but you find at least several articles in the Czech media every month. If you look into the media of other countries, you will find almost nothing. A related example of this silence is the absence of Dublin IV in Wikipedia – as far as I can see. It's amazing that a regulation of this importance could be approved in some obscure rooms of the EU institutions and change the face of the continent without any real discussion among the European citizens – who wouldn't even know what's going on. Maštálka outlines various responses, including EU lawsuits against the regulation and the policy agreed by the Czech political institutions to ignore the "approved" agreement. He mentions that such a policy would massively increase the already strong calls by Czech citizens in favor of Czechout. Mr Jiří Weigl, an aide of Klaus' and a historian, says that it has to be refused, vetoed, not signed. This isn't how the member states can be dealt with. Lawyer Mr Tomáš Břicháček gave a longer answer in which he wittily compared the "reference values" to communist-era fines for "excessive squared meters" (for people with too big apartments) or to Fantomas' "tax for the right to live" (Fantomas is a French answer to the James Bond movies – you should watch them if you haven't). He explains how inhuman quotas and similar policies are, what tensions would be caused by that bill, and ends with a Biblical proverb that just like a dog returns to its vomit, a moron repeats his stupidity (I hope that native speakers know the correct English wording). Mr Zdeněk Koudelka, a small university's president, reviews some similar treaties in the past and clarifies that Dublin IV wants to cut the link between the population on a territory and decisions about the border. Dublin IV is just a tip of an iceberg – the general loss of sovereignty is what is at stake. Czechout political activist Mr František Matějka says similar things and mentions that the €250,000 fee is a legalized trade with humans. He argues that the policy wouldn't solve any problem related to migration and is intrigued by the specific regulation that the migrant has the duty to "stay where the EU authorities tell him to stay". Such policies liquidate the safety and nation states and the earlier the EU is dissolved, the better. Teacher Mr Zdeněk Lanz, whom I know in person, describes the fine as a possibly devastating and wants a discussion among Czech citizens and politicians. That should include politicians' plans for a possible existential threat to the Czech Republic. He wants to restore the draft and rebuild the Czech Army from a bunch of expedition units to a genuine defensive military that could protect the territory against the spontaneous entry of aliens. If and when Dublin IV comes to force, the government should activate aforementioned policies and work on the Czechout referendum. We can't allow Germany (with the help of France) to destroy everything that we have built after the latest intervention (he probably means the Second World War). After the 1938 Munich Agreement, we couldn't defend ourselves because it would have been suicidal, but now we should. Sociologist Dr Petr Hampl whom I also know in person points out that the introduction of Dublin IV would turn countries like ours to a protectorate. That's not just a funny exaggeration, he argues, but the word would be valid literally with all the attributes that protectorates have. (A protectorate is a country that gives up and hands out its defense and existential law enforcement activities to a parent country that controls these existential things through a protector.) He doesn't mince words when he says that if our government starts to behave as the protectorate government during the Nazi occupation, it should also expect to be charged with treason (as collaborationists) sometime in the future just like the protectorate government members (yes, lots of these "Bohemian and Moravian ministers" were executed after the war). He doesn't urge people to organize such trials – he just says that certain patterns keep on returning and big moves of this kind often lead to overreactions on the other side. Before that point, he recommends to ignore Dublin IV itself and lawsuits related to complaints that we ignore Dublin IV and to discourage the activity or prosecute the organizations that defend Dublin IV on our territory. He would expect the Czech government to persistently derive its steps from the support by the public. Mr Ladislav Větvička, a successful enough (and somewhat conspiracy-theory-liking) individual blogger at idnes.cz, reminds us that he has used a nickname for Dublin IV, namely Munich II. (In the Munich 1938 agreement, the Munich Four Group – four strongest Western European powers – agreed to donate the Czechoslovak borderland to Adolf Hitler. France's and Britain's Czech allies weren't asked about their opinion.) He suggests that Munich II could be worse than Munich I and could be a key part of the Kalergi plan to which Eastern Europe remains opposed due to some experience. He wants us to notice that countries with well-defined borders have good relationships and the biggest tension is in the ethnically mixed i.e. multicultural areas – the skirmishes between Slovaks and Hungarians across the border, Serbs and Croats, and the latent war between Serbs and Albanians. Multicultural apparatchiks are probably running out of time because the owners of their keys want speedy results. Europe has already been infiltrated, now their task is to make sure that even the East will be ready to explode into chaos after the unavoidable economic crisis in Western Europe. If Dublin IV is gonna be approved, the outcome will be a war, a terrifying war. Mr Jindřich Pilc, another blogger at idnes.cz, sees it positively and hopes that this proposed regulation will finally open the eyes of some pro-EU folks and will lead to an open conflict between the EU authorities and nation states' politicians which is badly needed because the EU can't continue in the direction we saw in recent years. Nation states' politicians should refuse the regulation even if it is approved. He believes that it would be beneficial for politicians in the government to escalate his or her dispute with the EU because of this issue. I don't know whether the threats could be made irrelevant and whether the peace could be kept. But my main point is that it's not wise to ignite a war or something of this magnitude because of a vanishing or extremely tiny number of assigned migrants (or because of one billion of euros in fines or less). A rather young right-wing lawmaker from the Czech Parliament, Jan Skopeček, wrote a report about a conference on migration in the EU Parliament. The main message is that Visegrád and Czechia don't seem to have a chance to defend anything according to the EU rules. With some Visegrád Group exceptions such as himself, almost all speakers were hyperpolitically correct. Europe is ageing and the Muslim immigrants are the continent's saviors, a majority (!) was saying in one way or another. Humans are at the top which is why the European countries have to be transformed to new Afghanistans, Syrias, and Islamic States. A hyper-Marxist comrade from Greece's Syriza had another reason why they must be absorbed all over Europe: the migrants could go on a hunger strike! This sounds like a joke but I suspect that the communist loon meant it seriously. Czechia and/or Visegrád won't win any vote in this environment where extreme loons have become an absolute majority. He described Brussels and especially the EU buildings as grey, frustrating, and images from a dystopia. His speech was reasonable but reiterated those hopefully well-known attitudes – external borders have to be defended, causes and not symptoms have to be cured, dictate would be highly counterproductive, and so on. Among other interesting things, there's a detail at the end: Germany is apparently planning some consolidation of the Muslim migrant families which could bring 220,000 new Muslim migrants to Europe or Germany every year! Well, given the fact that the number of relatives of relatives of relatives (N times) increases exponentially with N, I suppose that the estimate 220,000 is expected to increase exponentially, too. The Parliamentary Letters brought us an unbelievable, totalitarian-era-resembling TV segment in which Isabel Schayani (!) tells Hungary, Poland, and Czechia that they should go to the kitchen and out of the EU if they don't approve the absorption of lots of migrants. I left her a message on Twitter reminding her that it's Poles, Hungarians, and Czechs who co-decide whether arrogant Persian bonershrinkers are allowed to stay in Europe, not the other way around!